The dashboard allows trainers to order Style Matters Online pre-paid for multiple users and manage them with powerful user management tools. Price includes Dashboard setup and ten User Accounts. 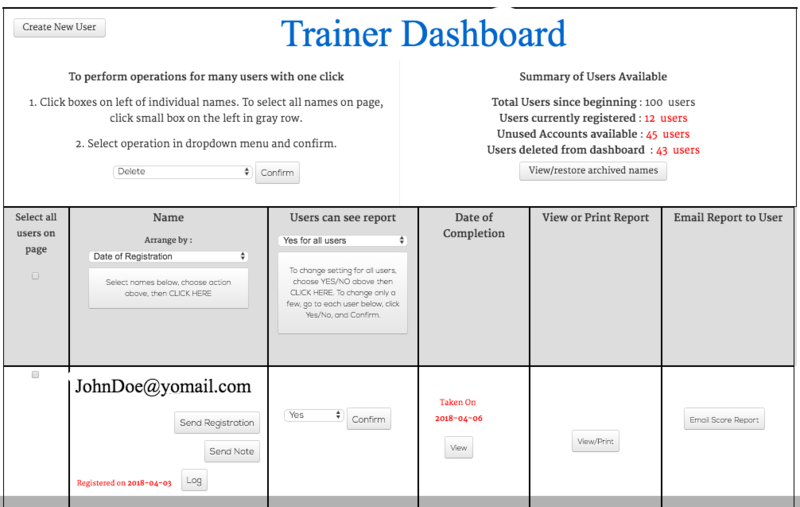 Dashboard provides powerful user management tools for trainers by consolidating registration, communication, monitoring of use, and score review in one location. Trainers whose only need is to send login instructions to users for pre-paid access may prefer our Coupon Code access which requires no setup or entry of users names. Register users in a few seconds per user. You can also import a large list in an Excel file. Monitor at a glance who has taken the inventory and who has not. Send registration info to users with any instructions you wish to give them, with a single click. Users can then go to the inventory with a single click of a button contained in your email. They land on the first page of the inventory already logged in without having to enter their info themselves. Send notes to users, as individuals or a whole list, with a single click. Do Score Review Management, that is, manage the timing of when your users see their scores. Set configs so users do not see their report at time of taking the inventory; rather score reports are sent directly to you. Email the Score Report directly to any user at a time of your choosing with a single click, without having to open it or type an email address. Download a user’s Score Report with one click, so you can view, print, email, or save it as a PDF file for easy access later. View a Log of all events for each user, in case you forget whether or not you sent registration, etc. Export scores of all users into an Excel spreadsheet, for easy aggregation and analysis. Keep track of number of users you have paid for and order new User Accounts.